Tonya Wilson is currently serving as the Human Resources Benefits coordinator for San Antonio College and Northwest Vista College. She has been employed with Alamo Colleges for three years. As Benefits coordinator, she will be available to provide daily support and guidance to employees, answer all benefits, retirement, and leave of absence questions. 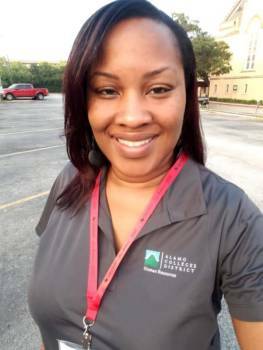 Prior to Alamo Colleges, Tonya worked in the corporate world as an insurance account manager. Tonya says she enjoys spending time with family, and she’s also active in the community. She was recently awarded The People’s Choice Award in the Community category from Tha1 Media Hub. “I’m excited to be back and a part of Alamo Colleges,” she said. “This is where I started my education. I was a St. Philip’s College graduate in 2004”. Tonya is at NVC every Wednesday, located in Pecan Hall, office 102 G. She can be reached by email at twilson47@alamo.edu.